Law enforcement officials are reportedly speaking to Joyce Mitchell, a 51-year-old Clinton Correctional Facility employee and grandmother who they say became smitten with escaped murderer Richard Matt and planned to help him and fellow inmate David Sweat escape. Law enforcement reportedly believes she planned to act as a getaway driver before getting cold feet. NBC reports that Matt “established a relationship” with Mitchell over a period of months. State employment rolls indicate that she’s worked as an “industrial training supervisor” at the facility since 2008; Reuters reports she was stationed at the tailor shop. At a press conference Wednesday, State Police Superintendent Joseph D’Amico reportedly said only that Mitchell “befriended the inmates and may have had some sort of role in assisting them.” NBC’s source(s) are telling them she’ll be criminally charged, although no charges have been announced. Matt and Sweat still haven’t been caught; police agencies are now also looking for them in Vermont. 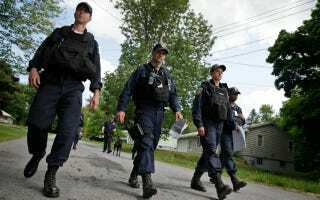 Law enforcement officers search for the escaped prisoners in Dannemora, New York. Image via AP.